Brian M. Thomsen and Martin H. Greenberg (eds.). 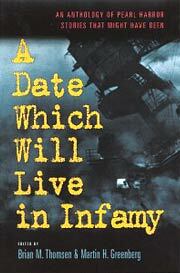 A Date Which Will Live in Infamy: An Anthology of Pearl Harbor Stories That Might Have Been . Cumberland House 2001. Comments: Thematic collection of original stories, including Doug Allyn's w88 android, Wlliam C. Dietz's "Path of the Storm", Brendan DuBois's "Victory at Pearl Harbor", Jim DeFelice's "Cain", Tony Geraghty's "The Secret History of Mr. Churchill's Revenge", Ed Gorman's "Pariah", William Hallahan's "The Fourth Scenario", Simon Hawke's "The Sumter Scenario: A Time Wars Story", William H. Keith's "A Terrible Resolve", Allen C. Kupfer's "December 7th, 2001 — A Classroom on the American Continent", R.J. Pineiro's "Green Zeroes", James Reasoner's "The East Wind Caper", and Barrett Tillman's "I Relieve You, Sir". Published: Cumberland House 2001 (1581822227BUY).